Dreams are Goals with Deadlines!!! You may love the idea of setting New Year resolutions but find that fatigue, flare-ups or life generally gets in the way, and you end up being more dispirited than when you started out. This year why not approach it differently by making small efforts throughout the year. The New Year is a wonderful opportunity to look forward with positive energy and lay out what you would like that year to bring you. There is no doubt that when you are more positive and set clear goals, you do actually achieve more. Studies have shown that people who set goals achieve more are less stressed, less anxious and more content with life generally. When we make a mental pledge to ourselves to do or achieve something (no matter how big or small) we DO feel a sense of achievement in achieving it. This feel good sensation can be re-experienced by acknowledging the success to yourself and others. You can make your goals your blueprint for your life. You should decide what you want (your goals) and then work out a plan as to how you intend to achieve them. The goals should be challenging and yet realistic. Goals can come from many areas of our lives but to simplify these we can put them into 3 areas of focus: personal goals; ‘thing’ goals; and economic goals. You might want to learn a new skill, get healthier, lose weight, learn to swim, conquer a fear, climb a specific mountain, visit your family more, be a better friend, write a book, improve your memory, get a specific job, study a specific course or pass those exams. Whatever they are, make them as specific as possible, and try to include a timeline by when you would like to have completed them which will give them some impetus. So now the goals are set, what can we do to help us achieve them? Something that is actually very helpful is to write down your goals (with measures and timeline where possible e.g. I will lose 2lbs by the end of March). Putting them in writing is a way of making them ‘real’ and gives you that feeling of making a ‘contract’ with yourself. The important thing is to make yourself accountable and do not blame others if you do not succeed. The most important thing is to decide what you want to do, and break out step-by-step how you intend to achieve it. In reality, there may be obstacles in your way before you get there so we need to accept that it may not always be plain sailing. When a bad day, fatigue or a flare-up causes a setback, then consider it just that – a setback, not a roadblock. Best laid plans will always be scuppered, but the real test is how we respond when things go wrong and how we choose to respond. To achieve important goals that we value and that are important we must accept it will involve a journey for us and we need to appreciate each step of that journey. So no matter how long the setback, try not to turn it into a roadblock! The biggest obstacle to achieving your goals can be yourself. Begin by being positive, believing in yourself and accepting that anything is possible. As Henry Ford says “If you believe you can or you can’t, you’re probably right!” Your results are predictable, if you believe you can do it you will, but if you believe and keep telling yourself you can’t, you certainly won’t. Feed your positive self, not your negative one. Then the impossible becomes possible. Be specific in what you want and turn your desires, dreams and ambitions into goals. Be willing to challenge yourself, be determined and don’t give up. Michael Jordan once admitted that he missed more than 9000 shots, lost over 300 games and on 26 occasions he was trusted to take the game-winning shot and missed. He said, “I failed and failed over and over and over again in my life … and that is why I succeed”. Failure is only the opportunity to begin again but next time, do it differently or better and achieve your goal. It’s worth it, and so are you. Above all keep positive and believe in yourself…..and of course, DO make those New Year resolutions and go for it with great determination. Remember Dreams can be goals with deadlines! Top Tips for New Year resolutions. Have a plan of action…plan A, plan B, plan C you will probably need them all. Believe in yourself, have your own positive mantra. Be determined, don’t give up. Don’t give up, persist, and take one step at a time. Make yourself accountable to yourself or others. And Finally….. CELEBRATE YOUR SUCCESS! For many of us, Christmas is a time we look forward to. We enjoy spending time with our families, preparing and enjoying wonderful food and exchanging gifts. But with so many things to shop for and so much preparation and planning to be done, it can also be a very busy time of year for people with arthritis that places extra demands on us and can cause fatigue, stress and even pain. However, by making a few small changes, you can preserve the enjoyment and prevent the hassles, making for a stress-free Christmas. Good organisation and planning can really help with Christmas preparations. This is easier said than done, but by making a list of jobs that need to be done you can take one thing at a time and reduce the chance of forgetting to do something. Do as much as you can in advance. There are plenty of things that can be made or done in the weeks or days before that will cut down the workload on the day. For example, you can make your sauces and soups in advance and freeze them. Then label them using an indelible marker to make them easier to find in the freezer. Take advantage of gift wrapping services in shops, but make sure to label the gifts to avoid confusion! Setting and decorating your table the week before will not only have you more organised but will also add to the festive feel of your house! Most large supermarkets now have an online shopping facility that will deliver directly to your doorstep. You can browse, shop and pay online and at the end of it, someone else will even do the packing and heavy lifting for you! This is especially helpful when stocking up on heavy beverages! Make it convenient. Many supermarkets are making life easier for us by providing great quality ‘convenience’ foods such as pre-prepared vegetables, readymade finger-foods and delicious deserts. Save yourself time and energy by buying pre-peeled and chopped carrots, oven-ready party food and mince pies. Only you will know the difference! We often feel compelled to do more than we can handle around this time of year and the stress of a heavier workload can exacerbate pain. Delegating jobs to your other half, your children or even your guests is a smart way of getting things done, not a sign of weakness. Ask your family members to help out on the day as their Christmas gift to you. Assign jobs that will make the day less tiresome for you such as taking care of the dishwasher or serving drinks. If you have guests coming, you could ask them to contribute to the meal by making the brandy butter or Christmas puddings. Make the job easier by using the right tools and taking regular breaks. Find arthritis friendly utensils to make preparations easier. Lightweight utensils with grips and bigger handles will make your preparations easier. Sit down whenever you can. Taking the weight off your feet will ease fatigue and enable you to get more done. Relax and enjoy! Remember, Christmas is a time to enjoy with family and friends. Try not to get caught up in the stress and do things at a pace that suits you. · Buy pre-washed and chopped vegetables. · Use arthritis-friendly kitchen utensils. · Take a load off – sit down whenever possible! · Delegate – you don’t have to do it all by yourself! · Enjoy! Remember that the day is about you and your family. Sally Borst, blogger and “Galloping Grandma”, shares with us her account of “Coping with stress and pain.” (Sally lives with severe rheumatoid arthritis, plus osteoarthritis). Having been blogging now for a few months and reading all of your blogs out there, I am surprised at how many tell their own particular journey through Chronic Pain. Very few of them offer a way to cope. After all, if you have chronic pain like I do with my RA, then you have it, and it isn’t going to go away. You are stuck with it! So I thought I would devote this blog to what I have learned over the 16 years of my RA and pass my ideas over to you. The first thing I would offer is LAUGHTER. A good giggle with a girlfriend, an amusing film, a funny thought that brings a smile. You will find that taking your mind off the pain eases it – even if it’s only for a short time. The second thing is to GET UP and do something positive. Be it a swim (our nearest pool is over 40km away, so no good for me) or a walk outside, preferably in the countryside. Breathe in deeply ( I do this often as I am constantly out of breath !) and look around you at all of Nature’s beauties while trying not to trip up! I put on neoprene mittens and use these to grip a walking pole in each hand. These have the advantage of keeping your stance upright and allowing you to look around instead of looking at your feet! While my two feet were being operated on and I couldn’t walk for over two years, I had the use of a quingo (see a previous blog of mine) which allowed me to go outside and walk or even run the dogs. What a fantastic feeling that was after being shut inside the house for so long! Even a rainy day looked marvellous and made me forget my aches and pains! Knowing that I faced immobility with my impending foot operations, I searched around for some hobby I could do and came up with PAINTING. I had painted 55 years ago at school, but not since then. I made enquiries and found out that a brilliant artist lived just about a mile from me and I asked her if she would teach me from scratch – and what fun we had (and still have)! A whole morning experimenting with all kinds of mediums and before much time had passed we became, and still are, best friends. 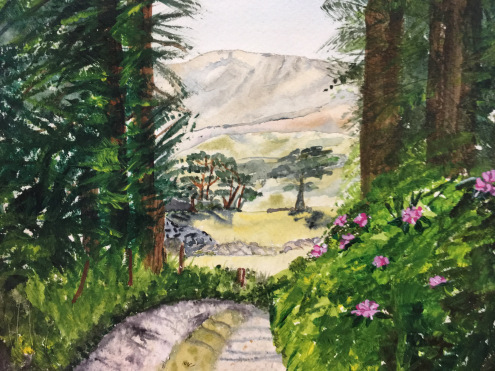 I just love the time spent painting – it takes me to whole other place in my mind, away from chronic pain – so much so that I forget all about it for a whole morning at a time. Here is one of my efforts….. I spend most evenings WATCHING TELEVISION. Sitting in my chair with my feet up and enjoying whatever takes my fancy. My long suffering husband waits till I go to bed, which is usually quite early, and then puts on all his men-telly programmes!! Freeing your mind up from constantly thinking about the pain you are in, sets you free. If the pain is greater than the programme on telly, then I take to the shower or bath. I have a bath-knight which lowers and lifts me up and down into the water in our upstairs bathroom as I think it would take the fire brigade to get me out of our other triangular jacuzzi bath downstairs, though I still look at it longingly! Last time I actually tried it, I couldn’t get out, and poor Pat had to strip off and get in with me to lift me out! We had a good laugh over that…..! I try to stay UNSTRESSED over as much as I can. With me, stress brings on an immediate sort of mini flare up of my RA. I start to feel immense fatigue and full-on pain. For this, I GO AND LIE DOWN, put the radio on to Radio 4 and try counting backwards from 100 – or 200 !! This is really hard to do and makes me concentrate on other things, and I actually can get the mini flare-up to subside, just by counting backwards! There are times when I have to take pain-killers, but I try to do without them as we can all do without constipation that they bring along for the ride! To sum up, over the years I have learned to control some of my chronic pain with my mind and finding other things to dwell on, and it really works. We are stuck with the pain, so let’s make the best of it and certainly love life and all the marvellous things it offers. Experiment with new horizons and keep moving forward in whatever manner you can! Gout is the most common form of inflammatory arthritis in men and women, and affects 1 in 40 people in Ireland. The condition can be extremely painful and if poorly managed can have a significant effect on quality of life. Gout doesn’t discriminate between rich and poor, fat or thin, men or women. Gout is often seen as a disease that affects people who are wealthy and overweight and popularly depicted as a ‘disease of kings’ with those affected stereotyped as overweight, middle-aged men who indulge in a lavish lifestyle of rich food. In fact, gout can affect anyone. Arthritis Ireland is hosting an information evening, ‘Living with Gout’, Wednesday 23rd November at the Radisson Blu St. Helen’s Hotel, Stillorgan Road, Blackrock, Co. Dublin, from 7pm (registration, networking & tea/coffee from 7pm and speakers at 7.30pm). Admission is free, and all are welcome. To book your place visit www.arthritisireland.ie or www.bit.do/GoutEvent. The information evening is kindly supported by A. Menarini Pharmaceuticals. Children with arthritis are fed up waiting in pain. 565 is the number of children waiting to see a consultant paediatric rheumatologist for the treatment of childhood arthritis, Juvenile Idiopathic Arthritis (JIA). The latest figures show that the waiting list crisis has intensified, with the number of children waiting in pain for over a year and a half increasing by an exponential 400% since January, 2016. More than 1,200 children are living with arthritis in Ireland today, making it as common as childhood diabetes. However, the paediatric rheumatology service at Our Lady’s Children’s Hospital, Crumlin (OLCHC) is inadequately staffed to deal with the volume of children waiting to be seen. There are just two dedicated consultant paediatric rheumatologists appointed for the entire country to cater for children who live with constant pain in their joints and many other parts of their bodies. There is no cure for arthritis but with the correct standards of care children can have as normal and as active a life as possible. The inadequate staffing levels are leading to waiting lists of more than a year and half for children with suspected arthritis. This is despite recommendations from the British Society for Paediatric and Adolescent Rheumatology (BSPAR), which states that children with suspected arthritis must be seen by the paediatric rheumatology team within four weeks of the referral being made. This is a national crisis, so enough is enough. As part of National Arthritis Week, Arthritis Ireland are calling for the urgent appointment of a third consultant paediatric rheumatologist to be appointed at OLCHC to help ease the huge burden on the already overstretched services. Children on waiting lists are not just waiting in pain; they are also at risk of permanent, irreversible joint damage that impacts on their ability to live a normal a life as possible. To support Arthritis Ireland sign our petition by clicking here or make a donation by clicking here .